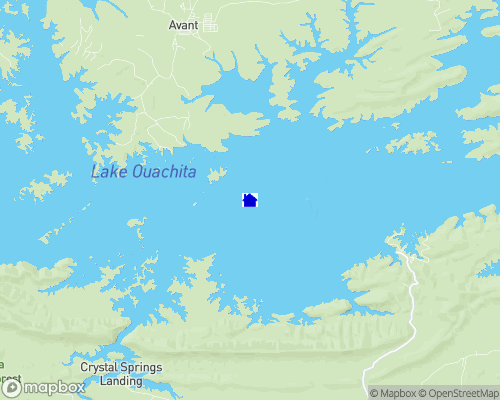 Lake Ouachita (wash'i*taw), a manmade lake formed in 1953, stretches westward from Blakely Mountain Dam to the headwaters of the Ouachita River. One area of the lake houses one of the largest quartz crystal veins in the world, and due to the clarity of the water this is a freshwater divers paradise providing a home for non-stinging jellyfish, sponge, and freshwater shrimp which are found in only a few of the cleanest lakes in the world. Arkansas's largest manmade lake stretches across 48,000 acres and has 975 miles of impressive mountainous shoreline at Lake Ouachita State Park. High in the Ouachita Mountains near the resort spa of Hot Springs, the exceptionally clear water of Lake Ouachita is popular with scuba divers, water skiers and fishermen. Unsurpassed scenic beauty, excellent fishing, water sports of all kinds and a prolific area for rock hounds are just a few of the natural attractions of this area. There are many campgrounds and resorts in close proximity to the Lake, and the area is attractive for laid-back family vacations. At the lake's eastern tip, the state park includes historic Three Sisters' Springs, once thought to have curative powers. This is also a prime area for natural crystal hunting and rock collecting. Recreation - Swimming, skiing, scuba diving, boating and fishing for bream, crappie, catfish, stripers and trout can be enjoyed in the open waters and quiet coves of Lake Ouachita. Location - From Hot Springs, travel three miles west on U.S. 270, then go 12 miles north on Arkansas Hwy. 227 to the park. Blakely Mountain Dam, which impounds water forming Lake Ouachita, is a feature of a comprehensive plan for the Ouachita River Basin being administered by the U.S. Army Engineers, under the direction of the Chief of Engineers and the Secretary of the Army. The objectives of the plan are flood control, navigation, recreation, and the production of hydroelectric power. The dam, located on Ouachita River, near Hot Springs, Arkansas, was constructed under the supervision of the U.S. Army Engineer district, Lower Mississippi Valley, at a cost of approximately $30,800,000 and was placed in operation for flood control in the spring of 1953 and power was first placed on the line in August 1955. The spillway, located about 1 mile west of the dam, protects the structure from overtopping by stored waters in the event all floods of record are exceeded. When filled to spillway crest elevation the lake extends up the Ouachita River Valley a distance of 39 miles, with a surface area of approximately 48,300 acres. The lake created by the normal power pool extends up the valley a distance of 30 miles and has a surface area of approximately 40,000 acres. The land and water areas of this project, which is located partially within the Ouachita National Forest, sustain important natural resources which become an inherent part of the project. To insure that these resources are developed to provide maximum sustained benefits for the greatest number of people, a plan has been completed for use as a guide in the management and development of the lake area and all its resources. The plan is based primarily upon land and water capabilities and provides for the conservation of project lands and waters, forests, fish and wildlife assets, and recreational areas, with full consideration given to soil conservation, malaria control, pollution, and the health and safety of the visiting public. Responsible Federal, State, and local agencies establish conservation guides used in the plan. State and local agencies and organized groups are also invited to participate in the recreational development of the lake for the public. Water quality? One of the cleanest in the U.S.
Boat Docks: Are they permitted? There are several thousand boat docks and one of the largest marinas in the country. Lake Ouachita is recognized as one of Arkansas' finest and superior fishing lakes where bass, crappie, bream, catfish, rainbow trout, northern pike and ocean stripers add to the lake's fishing thrills. Lake Ouachita is recognized as one of Arkansas' superior fishing lakes where the following fish are available in abundance. Lake Ouachita's wide open waters and quiet lagoons offer fun to water-skiers, sailing enthusiasts, canoeists, and scuba divers. Marina - A full-service, 70-slip marina provides rental fishing boats, motors and party barges, plus rental boats, slips (covered and uncovered) mooring buoys and transient slips. There are 112 individual campsites handily located for fishing and boating. Seventy-seven of these have dual-voltage and freeze-proof water hookups. All campsites have paved camping spurs, table, grill, bathhouses, and hot showers . Class A: Water and electric hookups, flush toilets, picnic tables, grills, hot showers, and dump stations. Class B: Water, restrooms, electricity, picnic tables, grills, showers, and dump sites are usually available.